Nothing beats the ability to leave the asphalt of the monotonous and boring meandering roads that sprawl all around Britain and really get some excitement into your driving life by experiencing the thrill of off road driving. What can be better than hopping on or in a vehicle that can take you up hills, in and out of wooded areas and over streams and traverse through the hectic course of mud, leaves, branches and other natural debris. Just like the whole the developed world, The UK has a thriving leisure industry in this area, and the activity continually reassures itself and you that it should be definitely considered as a venue for your event. 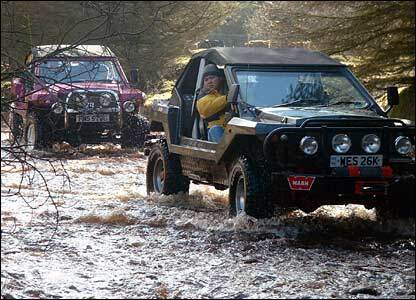 Experiencing the thrill of Off-Roading can be done as a birthday event for a party of people or, is more popularly frequented by Stag and Hen party’s as a way of relieving pre-marital stress and promotes stronger bonding with you and some of your friends. However, let us offer you a more glamorous way of getting to the said venue before you venture into the mucky world of driving through fields and forests. We can do this with great aplomb and a distinct air of flair and excellence when you hire from one of our extensive fleet of vehicles. Imagine the sheer excitement and prestige of indulging you and your friends in the fantastic experience of travelling in a limousine. You have earned this treat so let us treat you to some of the fantastic mod-cons that are available in all of our vehicles. For instance, picture yourself in one of our pink, white or black Limo Jeeps, blissfully sipping champagne whilst you get transported freely and easily by our professional chauffeurs to wherever you wish to go. When you arrive at your chosen destination you are given a veritable bevy of vehicles of which to indulge your wild side and become extremely messy on. Perhaps you want to be as close to the action as possible. Well this can be achieved by picking a quad bike as your transport of choice. Being a vehicle that is mainly used by farmers to tend to their crops, these little wonders can transverse even the roughest terrains and can reach fairly high speeds. However, if you want to go a touch faster you can’t get better than strapping yourself into one of the Rage buggies. These bad boys can reach very high speeds and are four-wheel drive so you will be slipping and sliding and pounding around the course in no time. The fact that it has a roll cage means that even if your over-exuberance means you flip it over and ‘come a cropper’ you will not get hurt at all. Of course, the real off-road ‘daddy’ is a Sherman tank and many venues allow you the prestigious opportunity of getting behind the wheel of these behemoths. Whatever off-road adventure takes you fancy; remember Lux Limos is here to offer you a high quality limo service that is a RIGHT not a privilege.